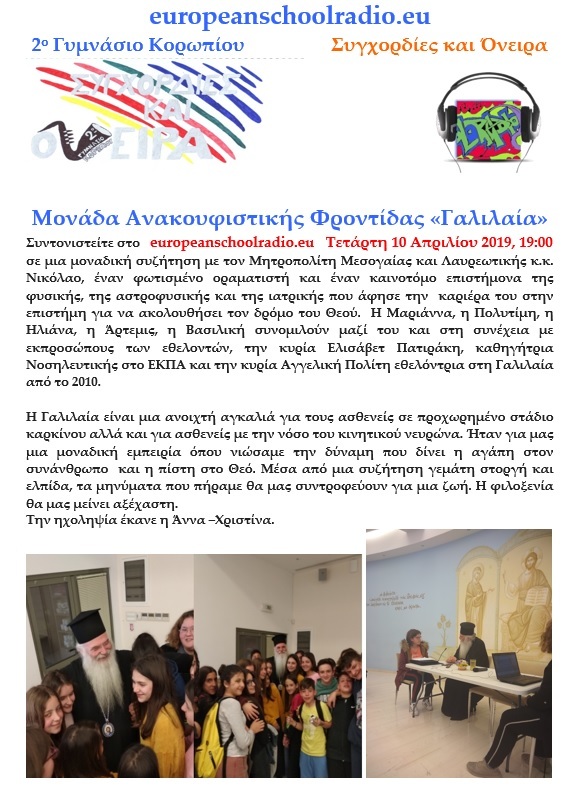 Tune in with Synchordies and Dreams at europeanschoolradio.eu , 10/4/2019 19:00, in a unique conversation with Bishop Nikolaos of the Holy Metropolis of Mesogaia and Lavreotiki, an enlightened visionary and an innovative scientist in physics, astrophysics and medicine who left his career in science to follow the path of God. Marianna, Politimi, Iliana, Artemis and Vassiliki talked with him and with representatives of the volunteers, Mrs. Elizabeth Patiraki, Professor of Nursing at the National and Kapodistrian University of Athens and Mrs. Angeliki Politis volunteer in Galilee since 2010. Galilee embraces patients with advanced cancer, but also patients with ALS. It was a unique experience for us, feeling the power that emerges from the love from one human to another and from faith in God. Our conversation was full of affection and hope and the messages we received will stay with us for a lifetime. The hospitality was unforgettable. Our sound engineer was Anna-Christina.